The key to any successful backpacking expedition is good recon: Accurate information about the conditions you will face on your trip will inform your gear selection and meal planning. This goes for becoming a first-time mother, too. When embarking on my third trimester, I found myself exploring kids' stores, reading parenting books, asking experienced parents for advice and scrolling through blogs by mothers of twins. What baby gear did I need? What kind of birth experience should I prepare for? What exactly was I going to do with two babies? Since hiking is one of my favorite activities, I spent a good portion of my maternity leave checking out stroller- and kid-friendly trails. My requirements: The trail had to be at least a half-mile long, level but unpaved (to give you the impression you're hiking, not just walking in a park), and a bit outside of town (for a sense of adventure). Given these requirements, I did not include the Headwaters or Hikshari' trails, both of which are splendid local walks to take with a stroller. I recruited fellow adventure mama Patricia Cheng Terry to explore Humboldt Redwoods State Park with me. She is a reliable paddling and climbing partner, and her infant daughter Anika made the perfect stroller-hiker test subject. 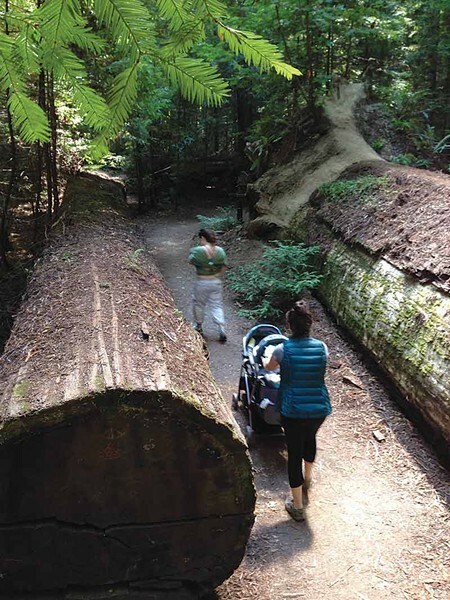 Humboldt Redwoods State Park has a number of very short trails (one-quarter of a mile or shorter) that are stroller-friendly, but we selected the Drury-Chaney Loop trail (2.5 miles) on the northern edge of the park as the first recon mission. The trail is just south of Pepperwood on the Avenue of the Giants, and the trailhead is on the right side of the road when heading south. There is ample parking in the pullouts on both sides of the road by the trailhead. The Redwood Hikes trail guide described the path as "surfaced with gravel," but most of it was hard-packed soil and redwood mulch. Nevertheless, Anika's jogging stroller maneuvered like a champ. The trail was lush with redwoods and quiet despite its proximity to the Avenue of the Giants. After six-tenths of a mile, the trail crosses a dirt jeep trail and then loops through fern-carpeted woods and across a small creek. We stopped a few times to nurse and adjust the stroller, but still completed the entire hike in about an hour. We were able to keep a steady pace, and Anika was thoroughly entertained by the sounds of the forest and the light filtering through the redwood branches. (Or something — who knows what's going on inside a baby's head?) We had a little picnic in a sunny patch of grass by the trailhead and congratulated ourselves on a successful mission. Three months later, I returned to the park to explore another trail, this time with my own stroller and my infant sons. I had planned to do recon on the Bull Creek Flats with Patricia and Anika, but a few hiccups (childbirth, sleep-deprivation) caused delays. When family came to visit, I took advantage of the extra hands and took the boys into the redwoods for the first time. We started our hike in the parking area of Rockefeller Forest, just off Mattole Road. We loaded the boys into their double, non-jogging stroller. There were lots of mosquitoes in the damp, warm parking area, but they weren't noticeable once we started on the trail. The short (six-tenths of a mile) loop trail is wide, hard-packed and very popular. The stroller did just fine. We traveled counter-clockwise on the trail, passing beautiful displays of old growth, living and fallen. My relatives, both adult and infant, were sufficiently impressed. At the midpoint of the loop, one of the babies mounted a protest, so we took a break at the junction for the Tall Trees trail that overlooked Bull Creek. The water level was low, and the summer bridges were in, so we decided to ditch the stroller and carry the boys down to the water. Strapped into carriers, the boys calmed down and we were able to cross the creek and ascend the Lower Bull Creek Flats trail on the south side of the creek. The trail crosses a gorgeous alluvial plain before climbing up toward the Burlington campground. A side trail dips down to the water again at the confluence of the creek and the Eel River. We took it and picnicked on the sandbar at the confluence. We watched some "big kids" play in a swimming hole and assured the babies that as soon as they were old enough, we would be back to swim, too. We crossed back over the creek to rejoin the Rockefeller Loop and returned to the parking area. In total, our hike was less than 2 miles and easily done in two hours or so. Mission accomplished.